As I mentioned last week, Olivia had to have surgery yesterday. 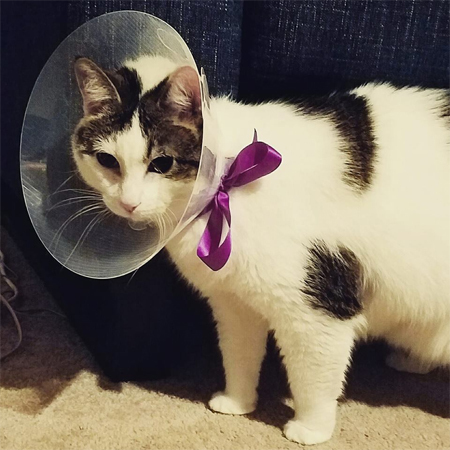 The surgery went well, and she's now home, beginning her recovery with some headgear about which she's really not pleased. By 3am last night, she'd wriggled out of it. So I'm guessing that keeping it on is going to be a struggle. Ms. Olivia Twist doesn't like anything that impedes her ability to eat even slightly. It's going to become increasingly important to win that battle, though, because as her sutures start getting itchy as the incision heals, she'll definitely want to mess with it. And it needs a full two weeks to heal before we take her back to get the stitches out. In other news, when we picked up Olivia from surgery, we had to take in Matilda for tests, because she's been feeling poorly, too. Like her sister, Matilda is so, so good at the vet. And she was being so tremendously silly (as usual) that the vet tech could not stop laughing at her antics. 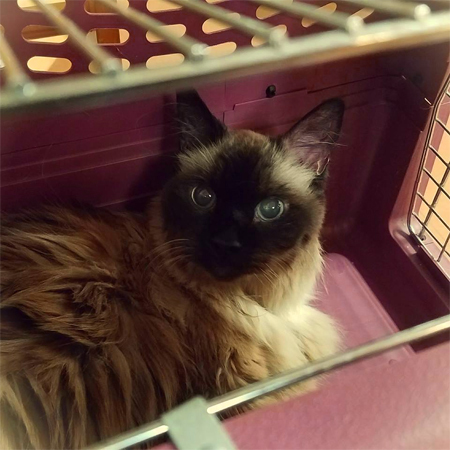 We haven't gotten the results of Tilsy's tests yet, but we're hoping it's just hyperthyroidism, which is treatable, and should help with a significant heart murmur that the vet discovered yesterday. It's been a rough few days for the old lady cats of Shakes Manor — and Iain and I are feeling a bit ragged, too. It's tough to see our girls in distress.